Body Mass Index (BMI) is a calculation used to measure body fat and, often, physical readiness for cosmetic surgery. 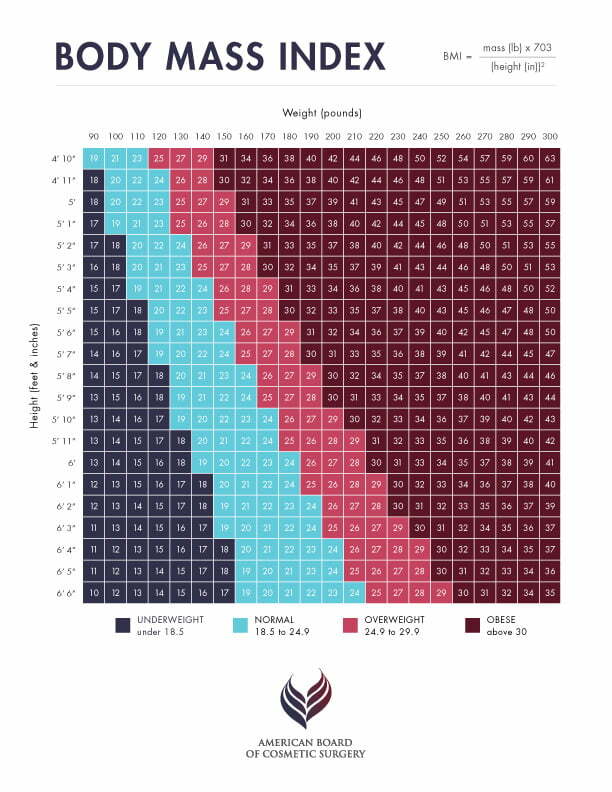 By using your height and weight, the BMI calculator can help assess your physical condition and determine where you fall on the Body Mass Index. Note: Body Mass Index is best suited for adult men and women. Weight ranges and category names are provided by the National Institutes of Health. Want to use this feature somewhere else? Click here to copy our embed Code. Many cosmetic surgeons use BMI to help determine if a patient is an appropriate candidate for a procedure. Calculating your BMI can help you gauge areas of your health you may need to work on prior to pursuing cosmetic surgery. Healthy: If your BMI falls in the “healthy” category, you may be a good candidate for specific procedures. Obese: If your BMI is calculated in the “obese” range, it is recommended that you bring your BMI to a healthier category before pursuing a consultation with a cosmetic surgeon. While BMI can be a good starting point in providing a reasonable assessment of your physical condition, this is not the only determining factor in your eligibility for cosmetic surgery. BMI calculations can be limited in their ability to correctly evaluate physical health in individual patients. It is important to consult with a board certified cosmetic surgeon to decide whether or not you are a good candidate for a particular procedure.